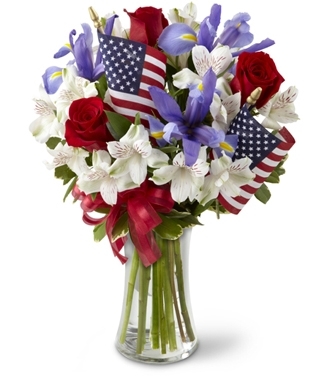 The Unity Bouquet sparks the hearts of all Americans with its patriotic beauty and dazzling color. Bright red roses mingle with blue iris arranged amongst white Peruvian lilies and assorted greens. Accented with two American Flags and a red, white and blue ribbon, this stunning bouquet arrives arranged in a clear glass vase to create a gorgeous way to celebrate our Independence Day.